Final paint, windows and lettering were installed by the end of 2014. 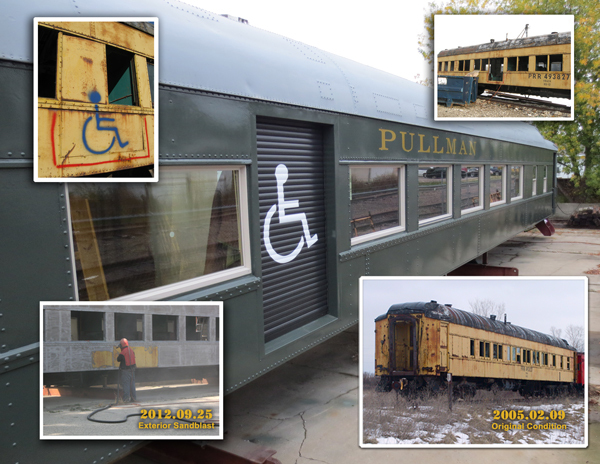 23 July 2015, Coopersville, MI – We’re in the final stretch starting our second phase (mostly contractors) and need to raise an additional $150,000 to finish the ADA Accessible Railcar. 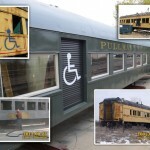 The initial $125,000 fundraising provided demolition and removal of asbestos insulation, materials to weather-proof the railcar (roof cleaning, coating & painting; prep window opening & install new windows; exterior & interior sandblasting; exterior painting), rearrange the interior to accommodate an additional 8 wheelchairs (total capacity of 10) and reinforce and rebuild (unplanned) the floor from the bottom up. 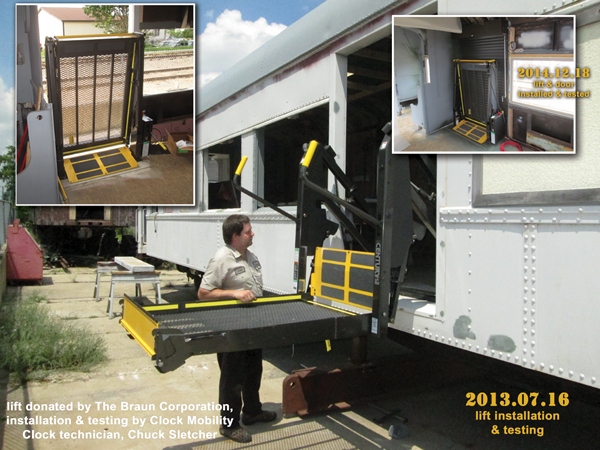 We were also able to fabricate a rollup door opening and install the handicap lift donated by The Braun Corporation. The initial fundraising assumed volunteer labor which never materialized so we had to hire a project manager & labor to get us to this point. We are now faced with a final $130,000 ± in contractor estimates with a 15% contingency fee for a total of $150,000. Reality behind us and in front of us gives us full confidence this will get the job done. We have a $25,000 challenge grant provided we raise an additional $100,000 of which we have successfully raised $27,000 in matching funds leaving us a balance of $98,000 to go. 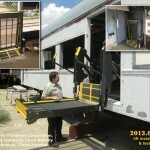 Part of the matching funds included a $2,000 grant provided by the Coopersville Community Foundation‘s Community Action Fund to pay for some of the wheelchair tie-down equipment. Please call 616-581-9340 if you have the ability to contribute and/or know of funding sources we may tap into. Otherwise you may email philip@marketingmanagementllc.com or mail donations to The Western Michigan Society for Industrial Heritage, PO Box 273, Coopersville, MI 49404.